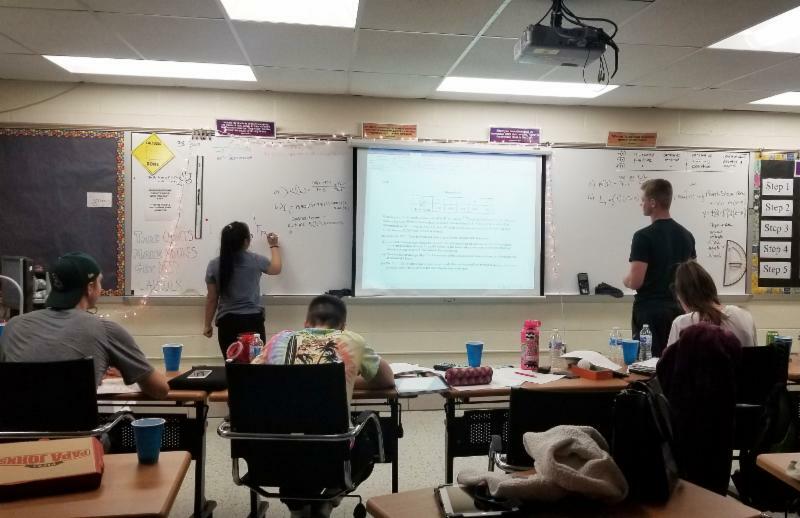 Last Friday night, AP Calculus students and Ms. Danielle Tornabene, held the first-ever, calculus lock-in. Students Maya Shock, Sarah Franker, Andrew Stephens, Colton Smith, and Garrett Bender stayed up all night to study AP Calculus. Ms. Tornabene said, "Our main goal was to have a dedicated chunk of time longer than available in a class period to see a large number of questions in order to analyze patterns in question asking and to maximize understanding and points earned." In between study sessions, students played games including tag/hide and seek in the upstairs hallway, whiffle ball, and putt-putt golf in the basement hallway. "We spent time working on past AP Calculus questions, including stringing questions types together so we had time to complete seven to eight similar questions in three-hour blocks. Two student rotations worked on the board competing to see who could get the most points in the least amount of time. Intermittent periods were spent answering multiple choice questions on personal dry erase boards," Ms. Tornabene said. The students were sleepy in the morning but ready to give it one more try before they take the AP exam in May. Did the winter weather dampen your car's illustrious shine? Is your vehicle ready for a Spring Cleaning? Then join us on Saturday, April 13 for a Free Car Wash (donations encouraged) at CPS. The Car Wash will take place from 10:00 am until noon. All proceeds will benefit the Class of 2020. Questions? Contact Mr. Carter at jimcarter@concordiaprepschool.org . Wednesday, April 10: Varsity Baseball vs Sts. Peter & Paul at home at 4 pm, Varsity Softball @ OLMC at 4 pm, MS Softball @ McDonogh at 3:45 pm. Thursday, April 11: Varsity Girls’ Lacrosse vs Hammond at home at 4 pm, MS Softball vs Bryn Mawr at home at 3:45 pm, MS Track & Field @ Loyola at 3:30 pm. Friday, April 12: Varsity Baseball vs Chapelgate at home at 4 pm, MS Softball vs Dumbarton at home at 3:45 pm, Varsity Softball @ Friends. Tuesday, April 16: Varsity Boys' Baseball at home vs. Beth Tflioh at 4pm, Varsity Boys' Lacrosse at Pallotti (Blandair Park) at 4 pm, Varsity Girls' Lacrosse at Mt Carmel at 4 pm, Varsity Girls' Softball at MD School for the Deaf at 4 pm. Sunday, May 5 at 3:00 p.m.
Tickets may be purchased in advance, online for $12. Tickets at the door are $15 ($10 for students and senior citizens). Online ticket sales will close on Thursday, May 2 at 3:00 p.m. Tickets will be held at the door. All shows, except the Dinner Theatre, are general admission. Doors open 30 minutes prior to the show. Tickets for the Dinner Theatre are $45 (includes the price of a ticket and a catered meal); the meal starts at 6:30 p.m. on May 2 with the show following at 7:00 p.m. More details about the Dinner Theatre will be available soon. Tickets for the Dinner Theatre will only be available through Monday, April 29 at 3:00 p.m.
April 18 is the last day to purchase a 2019 yearbook.. Go to www.jostensyearbooks.com to order yours today! Open to anyone over 21. Sign-in from 2:30 - 3:00 pm, happy hour from 3:00 - 4:00 pm. Cost is $25 per player and $45 per team. Cash prizes. Free to spectators. The event will be outside unless there is rain. More Information | Registration Form | Sponsorship form . Please join us for an afternoon of golf to be followed by a happy hour and dinner to benefit the athletic programs at Concordia Prep. Location and Time: Grey Stone Golf Course on Friday, June 14, 2019, 12:00 Noon check in, 1:00 pm shotgun start. Cost: $135.00 for single golfers | $500.00 for foursomes. Included with the Golfer Package: Golf and cart, box lunch after check in, hot dog at the halfway point, complimentary beverage-snack carts including beer, soda, water and snacks, four contest holes, dinner, raffles, and awards after the golf concludes. Dinner Guests: Dinner will be a great opportunity for spouses, teachers and Alumni to join our event, share a wonderful evening and support Concordia Prep. At a cost of $40 they can join us for Happy Hour and dinner, as well as have the chance to buy raffle tickets for great prizes. For more information to play or sponsor please contact Dan King at Dankinghome@msn.com . Wednesday, April 17: After Prom Meeting at 6:30 pm. Friday, April 19 through Friday, April 26: School Closed for Easter Break. Thursday, May 2: Dinner Theatre Annie at 6:30 pm. Friday, May 3: CPS Spring Musical Annie at 7:30 pm. Saturday, May 4: Spring Musical Annie at 7:30 pm. 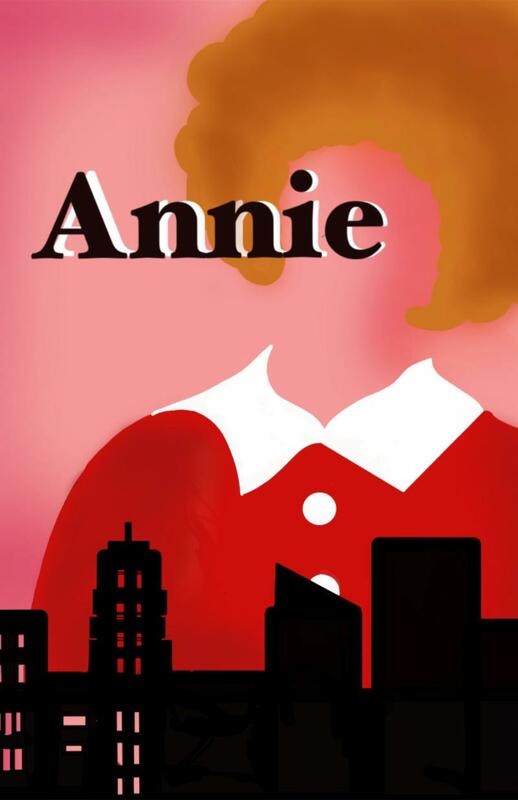 Sunday, May 5: CPS Spring Musical Annie at 3:00 pm. Monday, May 6: Senior Chapel at 8:05 am, Upper School Academic Awards and NHS Induction ceremony, PTL Meeting at 6:30 pm. Wednesday, May 22: Senior Prom at the Baltimore Museum of Industry, 7-11 pm. Monday, May 27: School Closed for Memorial Day. Tuesday, June 4 - Friday, June 7: Final Exams, noon dismissal. Friday, June 14: Report Cards Issued, Boosters Golf Tournament. 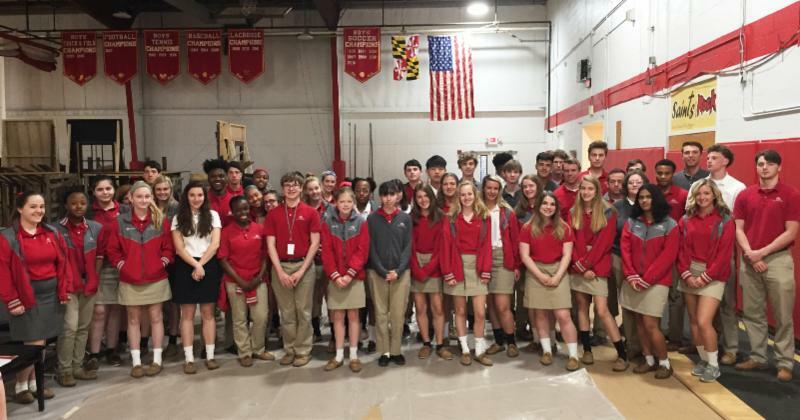 Concordia Prep is participating in the Coca Cola Give program .